Thursday, 6th Sept 2012. The FBM KLCI closed unexpectedly lower yesterday amid recent weakness on regional stock index and uncertainties surrounding U.S general election. Other news to follow. "-The Dow industrials finished slightly higher Wednesday, with Wall Street unwilling to make major moves ahead of a European Central Bank meeting the next day. Trading in a narrow range, the Dow Jones Industrial Average DJIA +0.09% rose 11.54 points, or 0.1%, to close at 13,047.48. The S&P 500 index SPX -0.11% declined by 1.5 points, or 0.1%, to 1,403.44, with utilities hardest hit and materials the best performer among its 10 industry groups. The Nasdaq Composite COMP -0.19% retreated 5.79 points, or 0.2%, to finish at 3,069.27." "-Asia shares tumbled Tuesday with declining commodity prices and fresh signs of weakness in the U.S. economy hitting stocks ahead of key events later in the week. South Korea’s Kospi KR:SEU -1.74%dropped 1.7%. Hong Kong’s Hang Seng Index HK:HSI -1.47% fell 1.5% to end at its lowest closing level since July 26. Australia’s S&P/ASX 200 indexAU:XJO -0.57% fell 0.6% and Singapore’s Straits Times index was off 0.5% late. The Asia Dow was down 1.5%. Japan’s Nikkei Stock AverageJP:100000018 -1.09% retreated 1.1%, and China’s Shanghai CompositeCN:000001 -0.29% trimmed losses to trade 0.3% lower. The moves followed a mixed performance for U.S. stocks Tuesday as trading resumed after the Labor Day holiday." "-Oil prices edged higher on Wednesday after spending most of the session wobbling between small gains and losses, as investors worried about weak macroeconomic data but expected weekly reports to show supply declines. Crude for October delivery CLV2 +0.44% gained 6 cents, or 0.1%, to settle at $95.36 a barrel on the New York Mercantile Exchange. Oil is up for two out of the past three sessions." "-November Soybeans finished down 20 3/4 at 1747 1/2, 22 1/4 off the high and 5 up from the low. January Soybeans closed down 20 at 1746 1/4. This was 4 1/4 up from the low and 21 1/4 off the high. December Soymeal closed down 8.4 at 525.0. This was 1.7 up from the low and 9.1 off the high. December Soybean Oil finished down 0.25 at 57.97, 0.27 off the high and 0.31 up from the low. November soybeans traded sharply lower into the close and settled near the lows of the day. Pressure was also seen in soybean meal and soybean oil throughout today's trade. Thoughts that recent rainfall has benefited soybeans crops in the eastern Corn Belt, along with views that the market may be slightly overbought triggered profit taking by bulls and added to the downside momentum. Gulf of Mexico soybean basis was mostly steady today on slow barge movement down the Mississippi River. Processor bids in the central Midwest have weakened this week as traders await new crop harvest. Calendar spread weakness along with the soft cash market offered a negative tilt to the market throughout the day. Outside markets were mixed with US Stocks trading slightly higher and the US dollar traded lower for most of the day but offered limited support to soybeans." The equity index went down for correction suddenly after staying a float above 1,640 level since the past two weeks. Failing to sustain gains, the FBM KLCI went down about 13.10 points to 1,641.01 level while index futures for spot contract slip aboutn 13.50 points to 1,635 level. This would be know as new swift sell-off as volume has increased at least two fold on spot month contract to 7,946 lots yesterday. Plantation was the sector effected badly followed some retracement on banking sectors as well. We are going to have more noise with a major political event on U.S and noticeable economy slow down on Asia countries. Technically, this will be the first weakness formed on spot contract after the index closed below 1,640 immediate support level yesterday. Major support is now reside on previous higher lows or previous low around 1,618. 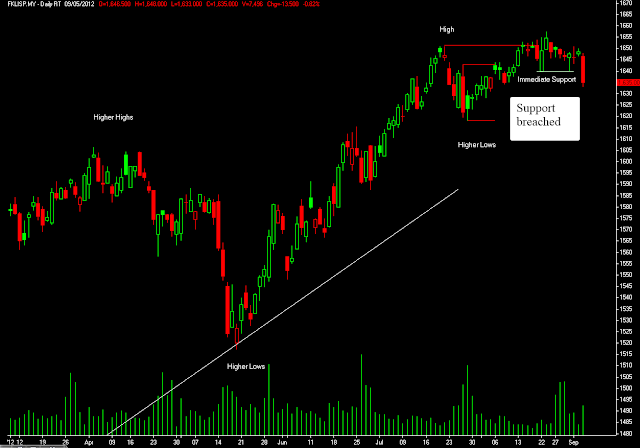 Medium term upside or uptrend would reverse its role to Bearish if the index futures manage to breach below this level. 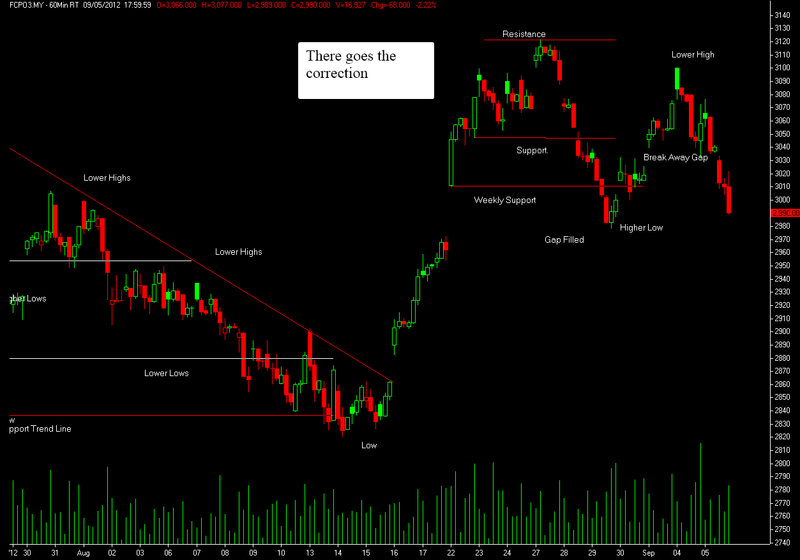 Apart from that, lower high and lower low formation have formed on daily chart which would signifies further retracement on index futures this week. For today, pivot point support for spot month contract is located around 1,629 followed by 1,623 while resistance is pegged at 1,644. Palm oil futures tumbled again yesterday even though it start off well in the morning session. Market manage to record some gains in the opening bell but it was a short live rally as Sellers quickly take advantage of higher price and starting to hard sell-down until the closing bell. The weaker price on Soy oil during Asia trading also contributed much on palm oil Sell-off. At close, the benchmark Nov went down about RM68 points to 2,990, closing just one point above the day low. Mean while the most active traded Soy oil went down about 0.41 cents to 57.37 cents per pound on 6.35pm Asia time, +8GMT. Unfortunately, improving export figures does a little to curb palm oil price from falling. Major lower high and lower low candles formation are now seem more noticeable when the benchmark Nov went on another correction yesterday. Moreover, the medium term Bullish momentum mentioned previously is likely jeopardize yesterday when the benchmark Nov closed below the psychological support level at 3,000. Long holders are advised to be cautious as palm oil price is likely continue to dwindle down as participants are expecting stocks to rise for this upcoming MPOB report.